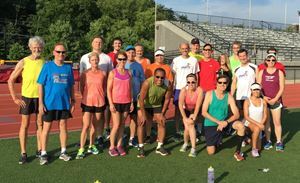 Thu 8/11 at GA track. 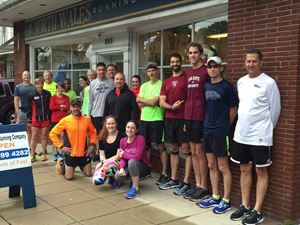 Despite the absence of "Coach Tom Jennings," a small crew showed up to take on Mother Nature. And "she" almost won, but not quite!! BTC: Jeff. 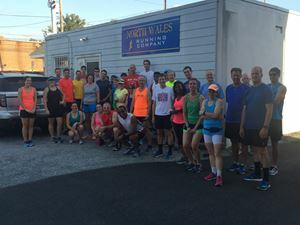 Thurs 8/4 at NWRC: gorgeous night for a run! 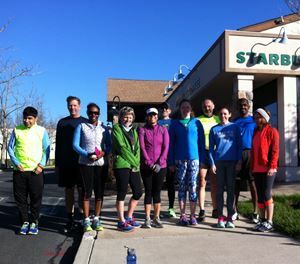 Tues 8/9 at NWRC: Thanks Mizuno Dan for the awesome kicks and Post run brews! Mon 8/8 at Fireside Bar and Grille. Advertising for the upcoming Lower Gwynedd Pike Fest, Saturday, 9/17. 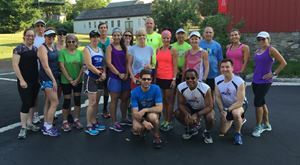 Ties Aug 2 at NWRC: Nice group enjoyed a break in the heat wave! Mon 8/1 at Fireside Bar & Grille. Another group of cheap foks looking for a free beer. And they each found one!! 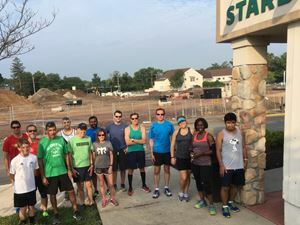 After the run. 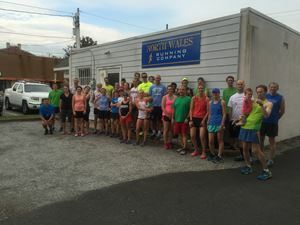 Tues 7/26 at NWRC: Great crowd to wear test Adidas. Thanks Kevin for the shoes, beer, water and swag. 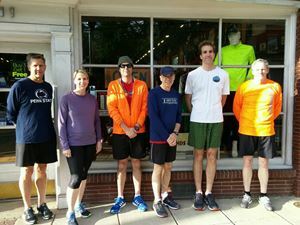 Welcome to Yale, Chelsea , Kevin from Adidas, and Chris. The pizza was awesome too. 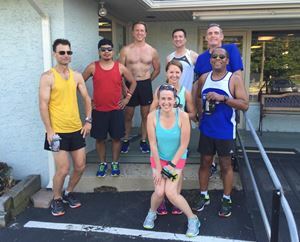 A hearty group got in some sweaty miles before the day became unbearable. 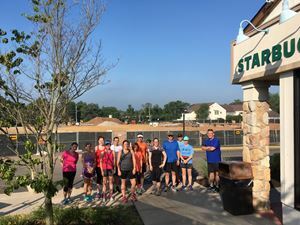 Others started early and are not pictured. Thurs. 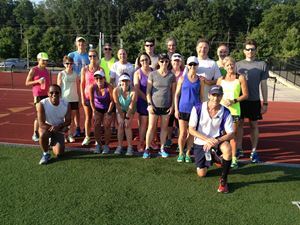 7/21 at GA track. Big turnout for Third Thirsty Thursday! 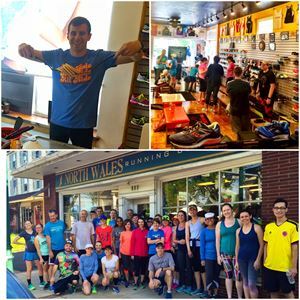 Run hard, drink beer! Got a prime table at MaGerks. 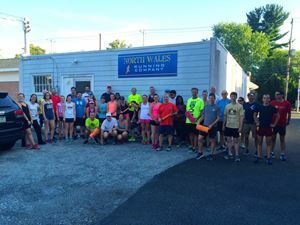 Tues 7/19 at NWRC: Trigger Point night! Great Swag too! Mon 7/18 at Fireside. Rains moved away, time for a run!! 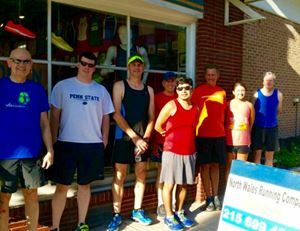 Tues 7/13 at NWRC: It was Saucony Run Pop Day! Thanks Austin for the ice cream. Thanks Scott for the beer. 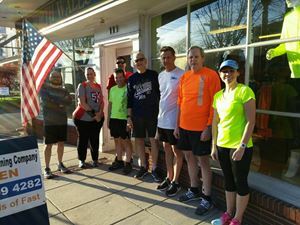 Welcome new runners: Bill. Bruce, Alan. Joan, and Cindy! Mon 7/11 at Fireside Bar. Great crowd, a free beer!! That's all you need. BTC: Rob. 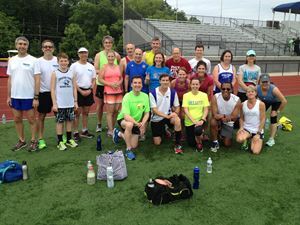 Thu 7/7 at GA track. Great crowd on a hot summer night! BTC: nice kid. 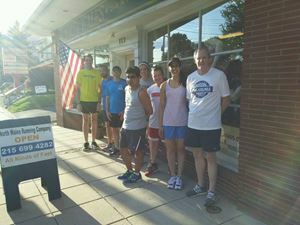 Wed 7/6 at Born To Run. H-O-T!! Clothing optional. 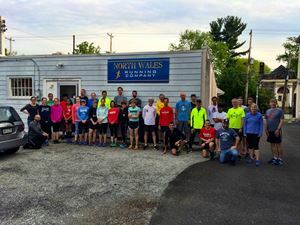 Tues 6/28 at NWRC: Welcome to Kate and many thanks to Alex from On for the wear test shoes! Mon 6/27 at Fireside Bar. 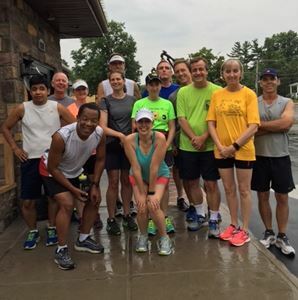 A little rain helped with the stifling humidity. Bring on the beer! BTC: Hilary. 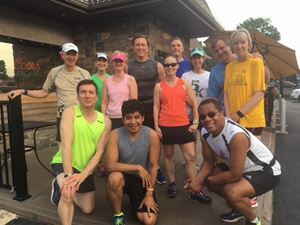 Sun 6/26 at Phil's practice run! Great crowd, warm day. Thanks for the water, Howard (again). 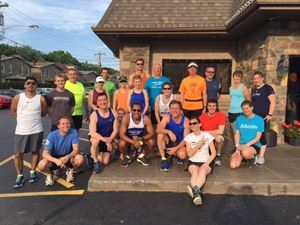 BTC Kenny S.
Seems like a lot of our runners were feeling blue. 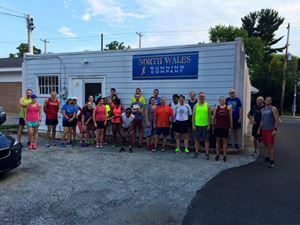 Ties 6/21 at NWRC: All kinds of new runners tonite: Joe, Casey Jeremy , Kelly James, and Erica! Mon 6/20 at Fireside. Summer solstice brings out a great crowd. Perhaps the beer also helped! 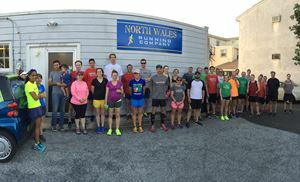 Tues 6/14 at NWRC: a panorama of awesome running people! 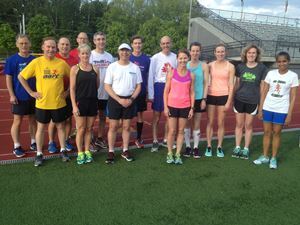 Thurs, June 16 @ GA track. 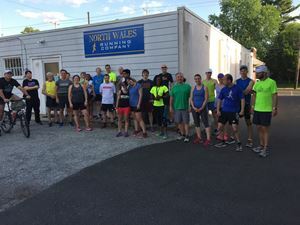 Biggest crowd of the season, followed by refreshments at the Ambler Yards Beer Garden! 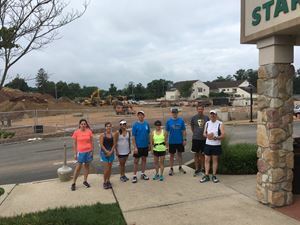 A dedicated group showed up for the Saturday morning Fun Run. 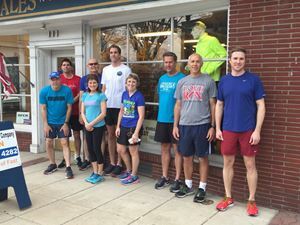 Welcome to Scott running with us for the first time. The view should change weekly. 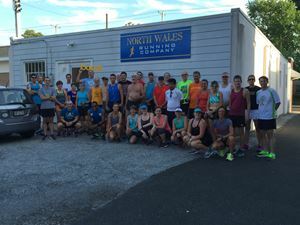 Thurs 6/9 at NWRC: More awesomeness! 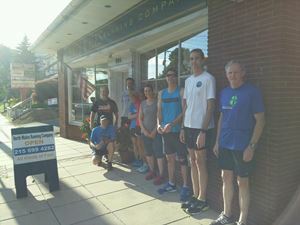 Ties 6/7 at NWRC: thanks James from Newton for Fates/Kismet wear test. 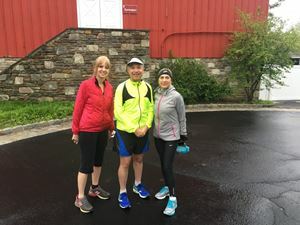 It was sunny at start and finish but poured in the middle. Welcome David! 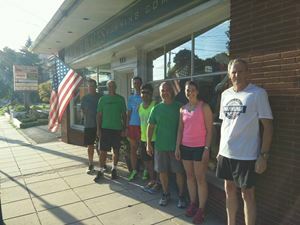 Wed 6/8 at Born To Run. 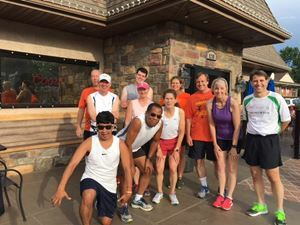 The group came together in celebration of Jeff's 61st birthday. Gulp!! BTC: Hilary. Mon 6/6 at Fireside Bar and Grille. 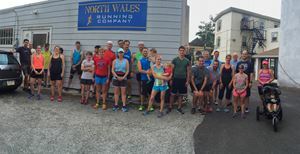 Nice crowd for a short run followed by a cold beer! BTC: Hilary. 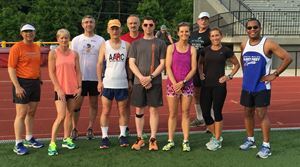 Thu 6/2 at GA track. 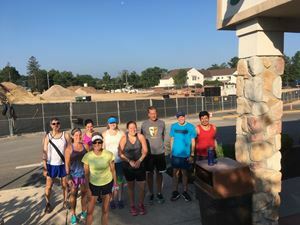 Nice group on a beautiful night. Thanks to Lee Levin (husband of Diane) for taking the photo! 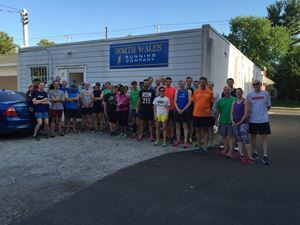 Ties 5/31 at NWRC: Nice crew out! Welcome to Phil! 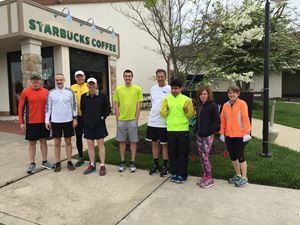 Sun 5/29, Temple Ambler. 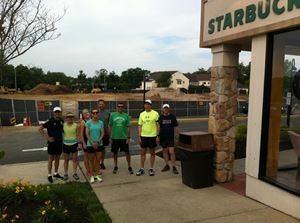 Great crowd for the Phil's training run, during a steamy Memorial Day weekend!! Anyone ready for the Fall?? BTC: Jeff. 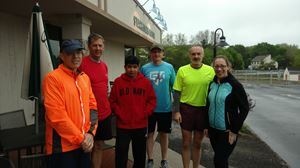 Tues 5/17 at NWRC: the clouds gave up raining precisely at run time! Welcome Tim! 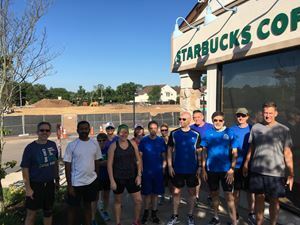 Sat 5/21 at Starbucks: welcome Ray and Greg! 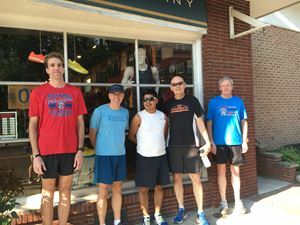 Sat 5/14 Special Event at NWRC: thanks Saucony Austin for the wear test Ride 9s and awesome pancakes! Thursday, May 19 at GA track. 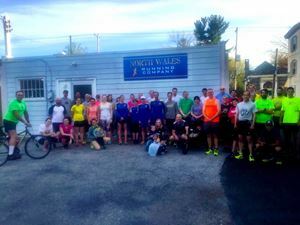 Nice evening and Third Thirsty Thursday = a big crowd! 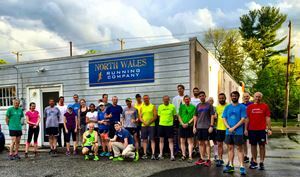 Some 800's and later a few beers an tacos at the Ambler Yards Pop-Up Beer Garden. 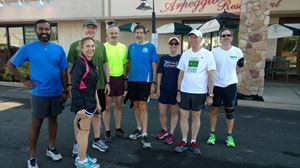 Tues 5/10 at NWRC: look at all those Catalysts! 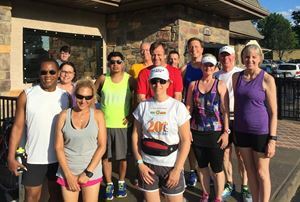 What a beautiful night for a run! 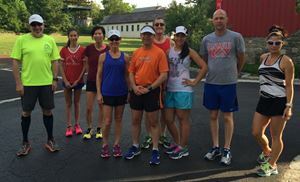 Thanks Mizuno Running Dan for bringing the them along tonight! welcome to Wendy! 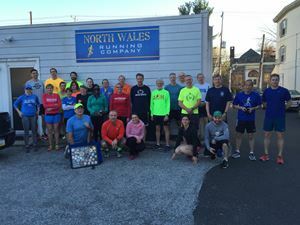 Thurs 5/5 at NWRC - a small but awesome group saw a ray of sunshine! 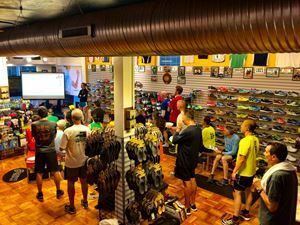 Tuesday's Plyometrics briefing and pizza. Thanks Professor Brian and his awesome team! 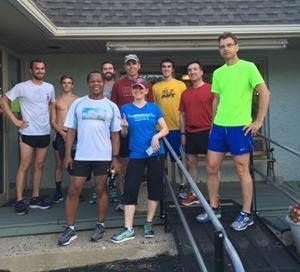 Ties 5/3 at NWRC: Arcadia PT Doctoral candidates briefed us on Plyometrics after the run! They are between Dan and Mike in front. Great stuff! Thanks. 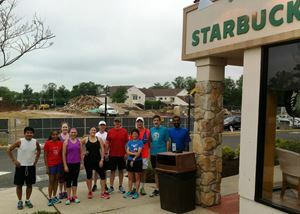 Saturday 4/30 at Starbucks in fromt of last two trees! 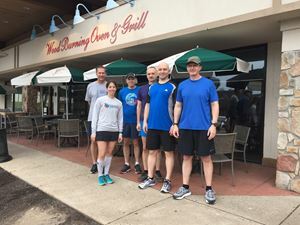 Tuesday 4/26 at NWRC: it was Features day! Thanks for the socks Steve! 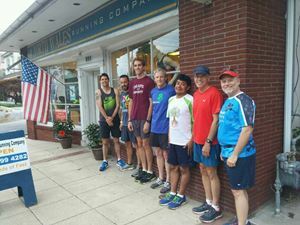 Welcome to new runner Kevin. 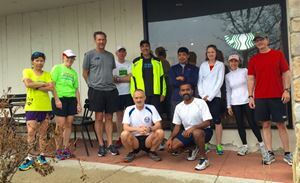 Rain stopped at run time! Thurs 4/21 at the NW RC! Good looking squad! 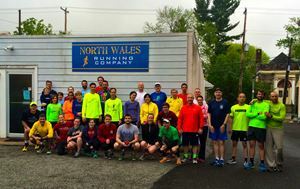 Tues 4/19 at NWRC: great crowd for New Balance wear tests. Thanks Kimmara! Welcome to Kiki, Jackie and Fred! 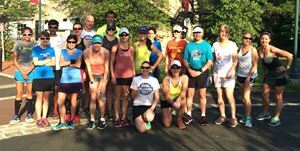 Congrats to Boston, Five and Dime and Innabah Trail Classic runners! Ties 4/12 at NWRC: Brian has some hardware to show!